Last Easter I wanted to bring a little Southern Tradition to the table for my soon-to-be husband. He had mentioned chocolate Coca-Cola Cake that he grew up with in Franklin, TN., but since everyone will be indulging with chocolate bunnies I thought of the classic Hummingbird Cake instead. No one from my San Diego Family had ever tried Hummingbird Cake before, so I thought it would be a delicious and fun cake to bake for everyone! Hummingbird Cake was originally submitted by Mrs. L.H. Wiggins of Greensboro, NC. in Southern Living’s February 1978 issue. This recipe is known to have won numerous blue ribbons at county fairs. The name Hummingbird Cake was derived from the humming sound “mmmmmmm” people made while eating this delicious cake. In a small mixing bowl, prepare the shredded coconut with a few drops of green food dye. Mix food dye and coconut until you have reached the desired green “grass”. Sprinkle green coconut on top of the cake, and along the rim of the cake plate. Top off the grass with the malt easter egg candy. I had the pleasure of working on a beautiful wedding for a beautiful friend of mine. There was not a dry eye at the ceremony of Meredith + John, and this dreamy couple wed in the picturesque hills of Alpine, CA. Between the romantic floral arrangements and delicious Yours Truly Cupcakes, Meredith wore a Maggie Sottero gown reminiscent of a rose. I was so touched to witness two people so deeply in love cherishing every moment, and how the value of family was ever so present. Meredith wished for a soft pink floral design for her bridal bouquet which consisted of Hydrangeas, Garden Roses, Cymbidium Orchids, and Dusty Miller. The Bridesmaids wore Navy to compliment John’s dress blues, and the subtle variation of the violet and navy hydrangeas in their bouquets brought out the color of their dresses. The romantic candelabra arrangements along with the white Manzanita Trees encrusted with Orchids & Crystals added an elegant touch. Guests were surrounded by candlelight, which set the mood after a gorgeous sunset in the hills. One of my best girlfriends is having a baby boy! Once I found out what his sweet little name was, I was all over this Birch Branch Sign with Twine Wrapped Letters! His Nursery is going to have a rustic yet modern appeal, and I cannot wait to see the whole design come together. You can create this DIY Twine Wrapped Letters & Birch Branch Sign, or simply hang the letters on the wall without the branch. There are few supplies that you can pick up at your local craft and floral supply stores, and depending on how many letters you wrap, I discovered that one letter took me about an hour to wrap. The “N” and the “A” were the hardest to wrap, and I double wrapped all of the letters to give them a complete look without any gaps. The key is to wrap the twine tight, and be sure to Hot Glue as you go! If your Wooden Letters have a similar “extended block” type font, I found cutting around 5-6 3″ pieces of Twine, and then gluing them to the ends allowed for the letters to be completely wrapped in Twine. Once you Hot Glue those little pieces, you can then begin to wrap around them and the rest of the letter with the Twine. I used around 3 1/2 Small Rolls of Twine from Michaels, and I would not recommend using anything smaller than a 6″-8″ Wood Letter (also from Michaels). The small opening for the “A” was especially hard to fit the roll through, or simply cut a really long piece of Twine to ensure you wrap around the opening. New Year’s Eve is just around the corner, and what is more festive than popping a bottle of Sparkling Champagne? 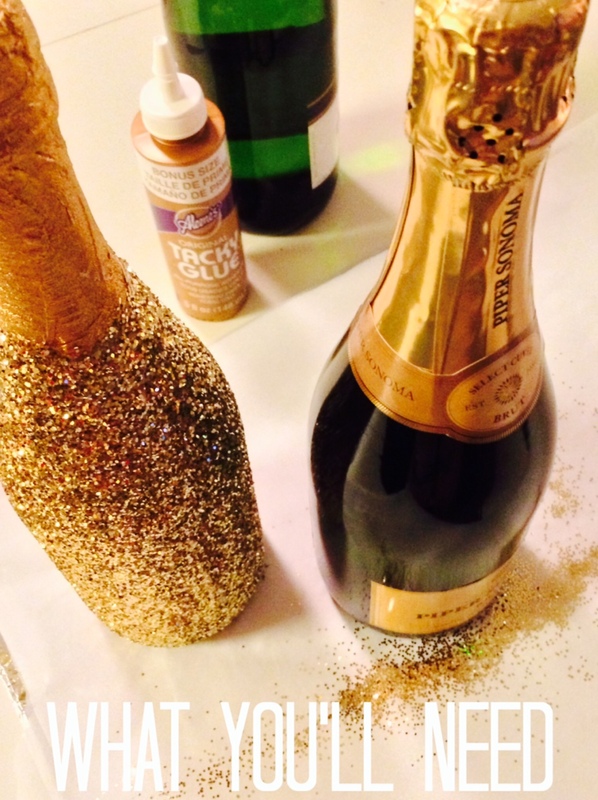 This easy DIY project will look so fab at your New Year’s Eve Party, or bring a bottle as a gift to the host of a swanky soiree! make sure your bottle is free of dust, if so wipe down with a cloth. cover a cookie sheet with foil, and lay a long piece of parchment paper on top of the covered cookie sheet. squeeze tacky glue all over the bottle, from the bottom of the foil down the the bottom of the bottle. spread the tacky glue to cover the bottle with your finger. pour the glitter in “rows” down the bottle, ensuring full coverage. pat the excess glitter around the bottle. wash glue and glitter off your hands. set the glittered bottle off to the side to dry on a piece of parchment paper. carefully unscrew the lid of glitter and set on cookie sheet. create a crease in the parchment paper, and carefully pour the excess glitter back into the jar of glitter. let dry over night & enjoy! For more New Year’s Eve Decor, Games, and Ideas, check out this post for all your party needs!